As the beautiful showcase of fall foliage ends, snow transforms Michigan into a winter playground. While skiing, snowboarding, snowshoeing, and ice fishing are all on the list of any adventurer visiting the Wolverine State, there is one activity that combines pulse-pounding fun with motoring excitement. Snowmobiling in Upper Peninsula Michigan is an unforgettable experience that will have you coming back to this gorgeous outdoor oasis over and over again. A network of over 3,000 maintained snowmobile trails in the UP fuels this unique and engaging activity. Request our free Michigan Vacation Guide for more things to do and places to see around our great state! It’s time to get out and explore! Explore Our Free Vacation Guide! Marquette Power Sports and Adventure Centre Arctic Cat supply the best equipment in the area for your journey into the UP wilderness. The six well-groomed trails feature some of the best snowfall for Upper Peninsula Michigan snowmobiling. The Marquette area has plenty of places to stop and grab food or take a break at, making this network of trails perfect for the beginner, expert, and any skill level in between. Check out the Marquette Trail Map to plan your excursion. Over 300 miles of maintained trails give Munising the title of “Snowmobile Capital of the Midwest.” The lake effect conditions from Lake Superior mean that snow accumulates earlier and lasts longer than most other areas. The extensive Alger County trails system connects Shingleton, Grand Marais, Manistique, Rapid River, and Marquette. Zip along the breathtaking Pictured Rock National Lakeshore on your way through several wilderness areas and small towns. Check out the Munising Trail Map to plan your adventure. Make sure you check out the Sault Ste. Marie Snowmobile Association for trail maps and more! A snowmobile trip through Paradise packs in plenty of amazing sights along the trails in the area. A visit to Tahquamenon Falls State Park is a must on your excursion. The mesmerizing falls have sections that ice over in the winter, creating a magical image set against the backdrop of powder covered pines. Visitors also need to ride up to Whitefish Point Lighthouse for vast, panoramic views of Lake Superior. Check the snowmobile trail maps and road conditions in Paradise before heading out on your Upper Peninsula Michigan snowmobiling adventure! Freshwater Vacation Rentals has the perfect Michigan getaway property for you! 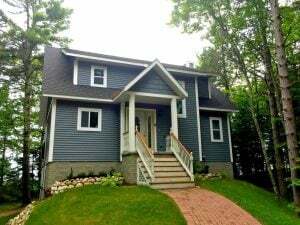 Whether you are snowmobiling around Marquette or venturing to Tahquamenon Falls, our extensive list of Upper Peninsula vacation rentals span the entire region. We have everything from one bedroom cabins for a romantic winter retreat to four and five-bedroom houses for a family winter vacation! Our list of pet-friendly properties allows you to bring your favorite furry friends along! Ready to start planning your adventure to Michigan’s Upper Peninsula? Check our availability and request your free Wolverine State Vacation Guide today! We can’t wait to welcome you to the Freshwater family!